We use the term material world to mean this world, where things are made of matter. Matter includes solids, liquids, gases, radiant energy, and space. The Bhagavad-gita explains that there's an additional category of matter–subtle matter–which includes mind, intelligence, and false ego, or the mistaken idea that the self is also material. We often say "material world" as opposed to just "world" because so much evidence in Vedic literature suggests that this world isn't the only world there is. Many statements point to an existence beyond this one, a spiritual world made not of temporary elements but of even more subtle energies: permanent reality, enlightened knowledge, and complete happiness. The difference between the material and spiritual worlds is the difference between matter and spirit; matter comes and goes, spirit stays as it is. Everything we see comes into being, goes through changes, then disappears or dies. That's the nature of matter. And because the self is essentially spiritual, we can't be perfectly, permanently happy in this kind of environment. But the Vedas say matter comes from spirit. There are detailed, step-by-step descriptions in books like Srimad-Bhagavatam of how the material world comes into being. Similar to the way things come into being in our experience—starting as an idea, evolving according to a plan, and finally manifesting as a complete whole—the Supreme Being has a purpose in mind when arranging for the creation of the material world, which then develops in a systematic way. The material creation is one of the Supreme Being's many energies. Material existence is only a fraction of all that exists. In the Bhagavad-gita, Krishna calls all the wonders of this world "a spark of My splendor." It's meant to be a kind of correctional institution for all of us who'd rather be deluded by false ego and imitate the Supreme Person than be ourselves—spiritual beings, meant to enjoy unlimited and perfectly satisfying relationships with Krishna in the spiritual world. 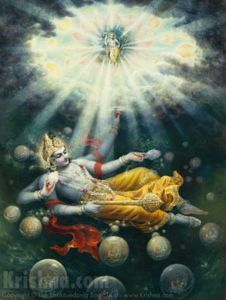 While we're here, we can strut and fret as we pass through a series of material bodies—animal, plant, insect, infant, youth, adult, old, etc.—and Krishna orchestrates this material world to temporarily satisfy our desires for temporary, illusory pleasures. He maintains it for a while, then winds it up again. Matter isn't permanent, neither is the material world. It's not our natural home, and isn't meant to be our permanent residence. Along with facilities for forgetting the Supreme Person and enjoying temporary pleasures, guidance is available to help us reconnect with our spiritual nature. We have the opportunity to learn about spiritual reality, and to have genuine spiritual experience—even while we're in the material world. What Is This Material World Made Of? — a list of "ingredients." This Material World Is Zero — in this conversation with a graduate student, Srila Prabhupada analyzes the relative value of the temporary, material creation. What's the Difference Between Spirit and Matter? - a look at what makes the material world different from the rest of reality. - how to distinguish between the Supreme Person's innumerable potencies. "In this material world we find that everything is temporary. It comes into being, stays for some time, produces some by-products, dwindles and then vanishes. That is the law of the material world, whether we use as an example this body, or a piece of fruit or anything. But beyond this temporary world there is another world of which we have information. That world consists of another nature, which is santana, eternal." "Earth, water, ﬁre, air, ether, mind, intelligence and false ego – all together these eight constitute My separated material energies." "The exact example is the spider and spider's web. The web is created by the spider, and it is maintained by the spider, and as soon as the spider likes, the whole thing is wound up within the spider. The spider is covered within the web. If an insignificant spider is so powerful as to act according to its will, why can't the Supreme Being act by His supreme will in the creation, maintenance and destruction of the cosmic manifestations?" "Yet there is another unmanifest nature, which is eternal and is transcendental to this manifested and unmanifested matter. It is supreme and is never annihilated. When all in this world is annihilated, that part remains as it is."